Increasingly exasperated at an ever-changing world that no longer resembles the one he was raised in, Tony Battagia starts a journal to cope with the growing frustration that now controls his life, documenting everything that’s wrong with the “new America” in his eyes. Set shortly after the 9-11 terrorist attacks, American Infidel, the first installment of the trilogy, explores the mind of a seemingly normal, middle-aged man—a man desperate to find meaning in his life and to “make a difference” in the world, beyond his business career; desperate for his divisive, manipulative, and impotent government to regain sanity; and desperate for his country to repay the murderers who changed the landscape of America and the world after 9-11. American Infidel is a brutally honest, politically incorrect, darkly comedic, and disturbing overview of what can happen to a man who is sick and tired of being sick and tired with the world he lives in and its evil hypocrisy. The actions he’s willing to take to “right the ship/reverse the whip” render this seemingly normal everyman unrecognizable, even to those who know (or knew) him. Is Tony Bataggia a hero or a disturbed heretic? It all depends on your point of view… Visit www.american-infidel.com for American Infidel apparel, news, excerpts from the second installment of the trilogy titled “Force Majeure”, TBag’s Blog, and more! Tom Baglio has spent the majority of his career as a sales and marketing professional in the paper and imaging industry. 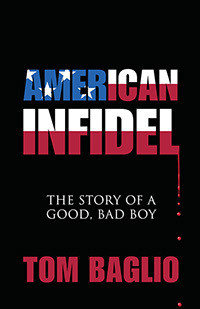 American Infidel is his debut novel, the first installment of a trilogy. Born in Rochester, New York, Tom was educated in the bosom of the Catholic Church, attending St Rita’s Elementary school and McQuaid Jesuit High School. He went on to graduate from the University of Dayton, with bachelor’s degree in marketing. He credits his tenacity to survival techniques learned at St Rita’s, where he received daily beatings from the nuns, most of which came from Sister Teresa Patricia (aka Attila the Nun). His mental toughness was challenged at McQuaid, where the Jesuits implemented psychological torture (in lieu of the nun’s physical beatings), and mandated a minimum 3 hours of written homework every night! The final portion of Tom’s training took place at the University of Dayton, where he was forced to endure 4 years of study, while under the influence of some of the most extreme intoxicants known to mankind. After 12 years of intense training, Tom entered the working world. Tom is married, has two children, six grandchildren, and two Jack Russell Terriers.